I Can Barely Draw Staff Meeting — NSA Letter. In the seven panels of this comic, five people are seen sitting in a meeting at an elongated table. These people are: a straight-haired woman, a first man, a curly-haired woman, a second man, and a third man. The first man holds an envelope and a letter. 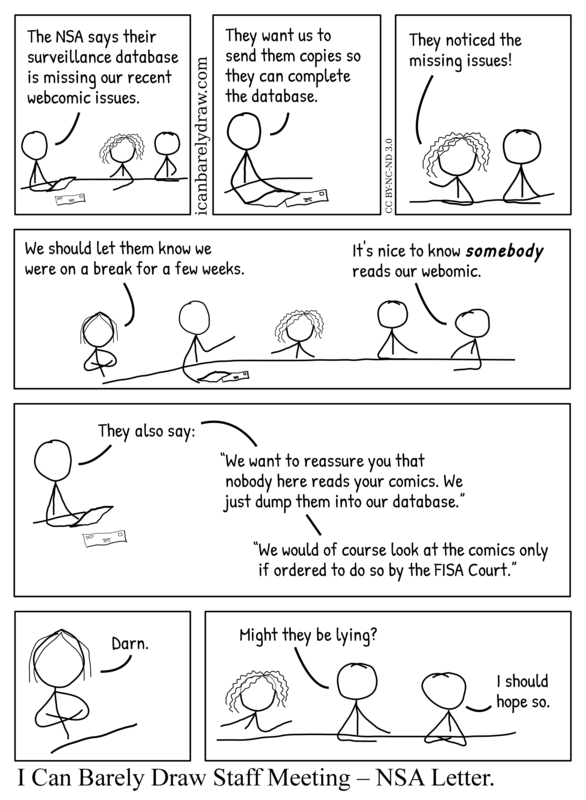 First man: The NSA says their surveillance database is missing our recent webcomic issues. First man: They want us to send them copies so they can complete the database. Curly-haired woman: They noticed the missing issues! Straight-haired woman: We should let them know we were on a break for a few weeks. Third man: It's nice to know somebody reads our webomic. Second man: Might they be lying? Third man: I should hope so. Title: I Can Barely Draw Staff Meeting – NSA Letter.